By now every World of Warcraft player has probably experience dungeon leveling to some extent, but there’s still one part of the experience that is just too easy to overlook. Dungeon quests are an important part of the overall dungeon experience, especially in these lower level instances. WoW players always used to skip over the dungeon quests because they were just too hard or an appropriate group couldn’t be gotten together. However, now players who are dungeon leveling will find so many additional bonuses from dungeon quests that they just can’t be ignored. Here are the top four reasons you should do dungeon quests. 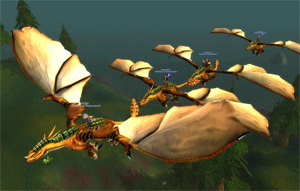 This first reason is more for WoW players who have been playing the game for years. Many of them never ran the lower level dungeons, so they’ve never seen that part of the game or completed the quests inside of them. Completing dungeon quests is like giving yourself a little new content to play in your favorite game. After all, who doesn’t like a new challenge when learning about a new way to level their World of Warcraft characters? Of course the best gear for your current level will drop off of the bosses inside the instances, so dungeon leveling does have you covered there. However, there won’t always be appropriate gear upgrades for your level dropping from the instance bosses, so sometimes you’ve just got to complete some quests in order to get new gear. The dungeon quests will reward you with much better gear than anything you’ll earn from the solo quests, so it only makes sense that you would want to fill in the gaps left by loot drops inside of the instances with gear you’ll get from completing dungeon quests. You’ll also find another major reason for completing dungeon quests just by comparing how much experience you get from doing solo quests and how much you get from dungeon quests. Did you know that completing one dungeon quest is like completing two solo quests, at least in terms of experience? Blizzard always thought that dungeon quests were much harder (and they were before the dungeon finder), so that’s why the experience is so much higher on them. However, the dungeon finder makes it easier than ever to find an appropriate group, so the dungeon quests are suddenly a lot easier. Finally, it just makes logical sense to complete the quests inside of the dungeons while you’re running through the instance. It’s like a two for the price of one deal because you’re gaining experience from all the monsters you’re killing, while, at the same time, completing a quest that will get you a whole lot more experience when you turn it in after the run. Not completing the quests that are available for your level’s dungeons sure does seem like a silly waste of time.